Iran says it has “succeeded” in copying an American drone it captured in 2011 and will soon take the replicated aircraft on a test flight. 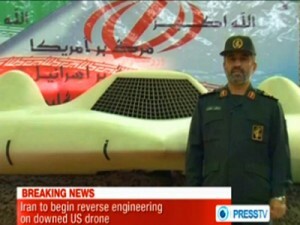 State television in Iran broadcasted images Sunday apparently showing a replicated US RQ-170 Sentinel drone alongside the original one, according to the AFP. Iranian Supreme Leader Ayatollah Ali Khamenei, who was inspecting the aircraft during an exhibition organized by the country’s Revolutionary Guards air wing, said the unmanned drone is “very important for reconnaissance missions,” the AFP reports. Iran has long claimed it managed to reverse-engineer the RQ-170 Sentinel, seized in December 2011 after it entered Iranian airspace from its eastern border with Afghanistan, and that it’s capable of launching its own production line for the unmanned aircraft. After initially saying only that a drone had been lost near the Afghan-Iran border, American officials eventually confirmed the Sentinel had been monitoring Iran’s military and nuclear facilities. Washington asked for it back but Iran refused, and instead released photos of Iranian officials studying the aircraft. U.S. officials have said Iran will find it hard to exploit any data and technology aboard it because of measures taken to limit the intelligence value of drones operating over hostile territory. Iranian state television on Sunday also showed images that were apparently recorded by an Iranian drone flying over a U.S. aircraft carrier in the Gulf, according to the AFP. Meanwhile, Iran’s president said Sunday his country would not surrender what it considers its right to nuclear development in upcoming talks with world powers, but that it would be “transparent” in negotiations over the contested program. The talks, resuming Tuesday, face an informal July deadline to hammer out a final deal to limit Iran’s ability to build nuclear arms in exchange for ending crippling economic sanctions it faces. While the moderate President Hassan Rouhani and Iran’s negotiators have the backing of Supreme Leader Ayatollah Ali Khamenei, hard-liners increasingly criticize the deal as giving up too much while gaining too little from the West. Speaking Sunday to a group of Iranian medical and nuclear experts, Rouhani appeared to be trying to counter hard-liners in his country who say he plans to give up the program in exchange for sanctions relief. “If the world seeks good relations with Iran, it should choose the way of surrendering to Iran’s rights, respecting the Iranian nation and praising Iranian scientists,” Rouhani said in the speech, which was aired live by state television. “The Iranian nation has never been after a weapon of mass destruction since it does not see it as legitimate,” Rouhani said. “We do not have anything on the table to submit to others except transparency,” he added. The West says Iran’s nuclear program could allow it to build atomic weapons. Iran says its program is for peaceful purposes, like medical research and power generation. Iran reached a historic interim deal in November with six world powers — the United States, Russia, China, Britain, France and Germany. In it, Tehran agreed to stop enrichment of uranium to 20 percent — a level that is a possible pathway to nuclear arms — in exchange for the easing of some Western sanctions. Also on Sunday, Khamenei criticized the West for its demands Tehran restrict its missile power, IRNA reported. Iran’s ballistic program has also been a concern for the West since ballistic missiles could be used to deliver nuclear warheads. Iran insists the missile program has no nuclear dimensions but is also adamant that its defense industry is a “red line” as a topic at the nuclear talks.